THIS WEEK’S OTHER FEATURED BOOKS, “BECAUSE IT IS SO BEAUTIFUL,” BY ROBERT LEONARD REID, AND “VANITY IN DUST,” BY CHERYL LOW, CAN BE FOUND BY SCROLLING DOWN BELOW THIS POST, OR BY CLICKING THE AUTHOR’S NAME ON OUR AUTHOR PAGE. THE EDITOR: Harrison Demchick, Jen Herchenroeder. SUMMARY: The year is 2021 and the money is still green. The fully privatized city of Tulsa, OK, is home to Sara Paige Christie, a teenage girl with her heart set on a film career in L.A. and her camera trained on the graffiti-covered walls of the city’s outskirts. In pursuit of a documentary subject that might propel her from college hopeful to film school admittee at USC, Sara has focused her ambitions upon a singularly ubiquitous tag―WH2RR?? From the facades of storefronts to the walls of public restrooms, the tag is appearing nearly everywhere. Its stark all-capital letters and demanding question marks have captured Sara’s imagination, even as the private security personnel of Free Force Tulsa (FFT) scramble to eliminate the marks with power washers, gray-overs, and full censorship, stripping even photographs of the tags from the locally accessible Internet. Sara has no doubt that there is meaning hidden in plain sight, and she sets off on a mission to find the person behind the mysterious tags while balancing an already full life: her final exams, her wild best friend, a physical fitness test that threatens her GPA, and a family that seems almost oblivious to what’s happening just down the street from their suburban home. With the exception, perhaps, of her father. A retired Marine turned FFT investigator, Sara’s dad has been on the trail of the graffiti artist for his own professional reasons. And if he knows what’s going on, he’s not telling Sara. And they’re not the only ones on the hunt…Tensions are rising in town and beyond. Between the machinations of the city’s home-grown megachurch, Chosen Hill, and the movements of a growing camp of homeless citizens parked just beyond Tulsa’s comfort and security, life in Tulsa is about to become very interesting, and Sara just might be in the right place to catch it all on film…… but only if she survives. THE BACK STORY: I knew for a couple of years before starting to write this book—which was written mostly in 2009-2010—that I wanted to write about something that truly scared me and that the reason it scared me is because it does happen, has happened and could happen again. Massive social upheaval is real and scary. Riots are scary. I wanted to tell a story of a middle America family caught in such times in a not too distant, recognizable, and most frightening of all, possible, future. I saw a family, particularly a girl and her dad. The girl was a filmmaker. The dad was a disgruntled policeman. Their worlds were going to collide. Six years later: See: Trump, #Charlottesville. I do just enough to achieve a semblance of verisimilitude and to move the story forward. I do not try to become an expert in a given subject matter. WHY THIS TITLE? : A contract city is a fully privatized city. WHY WOULD SOMEONE WANT TO READ IT? There are no, or very few, serious books for teens in the dystopian space. This one is. But it’s a crossover. It’s a gritty, grown-up book, story-wise, prose-wise. 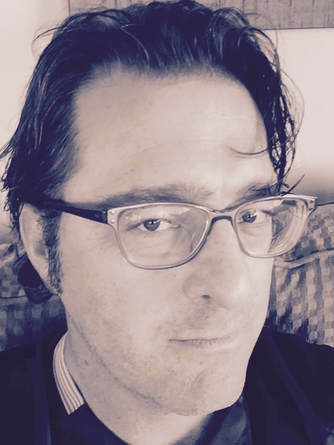 AUTHOR PROFILE: Mark Falkin lives with his family in Austin, where he is a writer, literary agent and recovering music attorney. His 2015 novel Contract City was nominated for Whiting, Shirley Jackson, YALSA, Edgar, PEN/Hemingway, LA Times, and other awards, was an Austin bestseller, and is in screen development in Los Angeles. His next, an apocalyptic horror novel, The Late Bloomer, is forthcoming from California Coldblood Books. It in no way involves zombies, viruses, nuclear holocaust, asteroids or aliens. 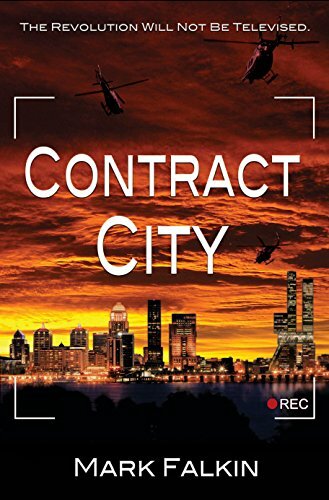 AUTHOR COMMENTS: Contract City completely presages what we have been and are now going through as a country. WHERE ELSE TO BUY IT: All the usual suspects online.